When it comes to dieting, we all well aware the struggles that comes with it. Protein and Fats are 2 staples of Keto diet, therefore investing in a good, natural keto protein powder that contains low carb is really important. I tried many well known products throughout the year (many from famous brands), but almost all of them failed to deliver results (fitness level / overall health), or taste (important in my book - for stickiness factor/ habit). It is easy nowadays to quickly get confused and indecisive. To avoid that, you MUST do proper research and I am here to help. Satisfying sweet tooth when dieting can be very challenging. Next, there are hunger, mood swings, and cravings. That’s why making a good diet plan is crucial for a successful result. Motivation and dedication play a massive role as well. Sticking to your goals is essential even when temptation is all around you. Keto diet can help, since you will consume very little carbs - your body won’t crave them. With no sugar in your blood, it is much more comfortable when you are not constantly craving food. Diet loaded with healthy fat, protein and essential amino acids will provide you with energy, strength, good health and beautiful body that you are after. I researched and tried various keto protein powders and shakes, and recipes that may help you on your journey. Keto protein shakes that filled with minerals and vitamins, may become a staple in your daily routine. They are refreshing, healthy and, most importantly, they fit perfectly in to any Keto diet plan. Remember that many sweetened shakes may contain 10-12 grams more carbohydrates than unsweetened protein powders. Low carb powders can help to meet daily protein needs without going over on carbs. How much protein should I eat on keto? What is a keto bomb? How many carbs can you eat and still be in ketosis? What About Plant Based Protein? Let's find which low carb protein powder is the best and why? Consuming enough amount of protein without the use of supplements is hard. Enormous portions of meat and egg whites will do their job, but that’s not so easy and enjoyable to eat. Instead, buying a powder that fits your diet is an excellent choice. 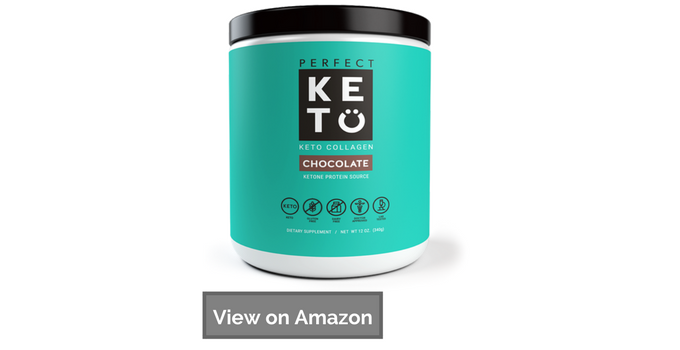 Keto Collagen protein is TEN grams of collagen peptides from grass-fed cows. You’ll have a proper protein intake, and your muscles will thank you for it.By mixing it with milk, water or your favorite beverage in a blender, you will have a fantastic taste that will make you forget that you’re even on a diet. By combining it with a high activity level, your results will improve. When you’re following keto diet, carbs are allowed in limited amounts. That’s why the Perfect Keto Powder fits perfectly into this type of food. Not only keto but also every low-carb nutrition plan should have this as a staple. In addition to that, the Perfect Keto Powder will raise blood ketone levels because of the MCT oil powder (medium chain triglycerides) that it contains. There are no artificial sweeteners, chemicals, coloring or artificial flavor. Also it is my go to brand for exogenous ketones base products (bhb salt). It’s great for gut health, and it’s also filled with fibers that won’t raise your blood sugar levels. Thanks to the grass-fed keto collagen protein, your energy will be improved. Also, it contains cocoa powder and stevia that are 100% natural, and the taste is even more delicious. The flavor of it is just like chocolate milk, and when you’re on a keto diet, you know that that’s almost impossible to achieve. I think it is the best protein powder for keto diet that you can buy at the moment. 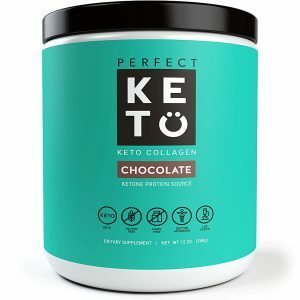 Few flavor available: Perfect Keto Collagen Chocolate, Powder Vanilla, Salted Caramel. You can take it by mixing with ice water, coffee, coconut cream or almond milk. I love taste with any if those options! 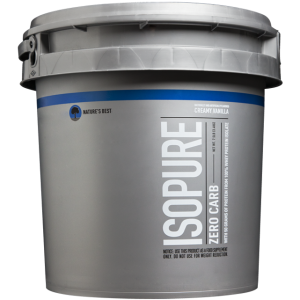 If you’re not satisfied with the first choice, our second recommendation would be the Isopure Zero Carb Protein Powder. The thing that is the most appealing about this product is its taste. It’s available in 14 flavors, and every single one of them tastes great. By consuming it, you’ll enjoy 25g of natural whey protein isolate protein. Additionally, it is gluten and lactose free, which means that it fits gluten-free diet. Beacause it is zero carb, your do not have to be concern regarding your carbohydrate intake. You have an option to choose between zero and low carb type. Hence, it’s a perfect fit for both keto and low-carb diet. Furthermore, it’s important to take care of your vitamins and minerals intake. Thanks to this product, you won’t have to stress out about that either. 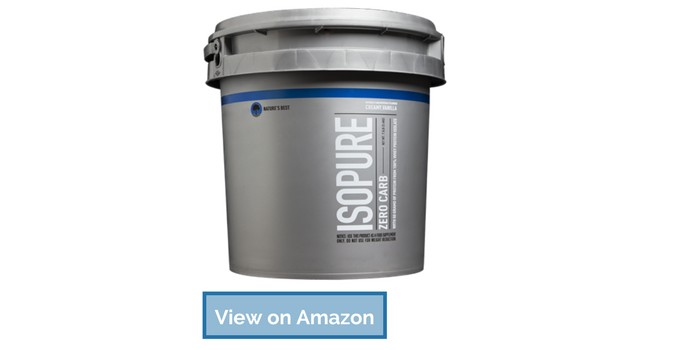 The Isopure Low Carb Protein Powder loaded with minerals and vitamins that will ensure you with good health, even when dieting. If you consume it first thing in the morning, you’ll have that boost of energy with a considerable amount of pure protein and vitamins. If you’re a vegetarian, you may be in need of a quick dosage of protein from time to time. 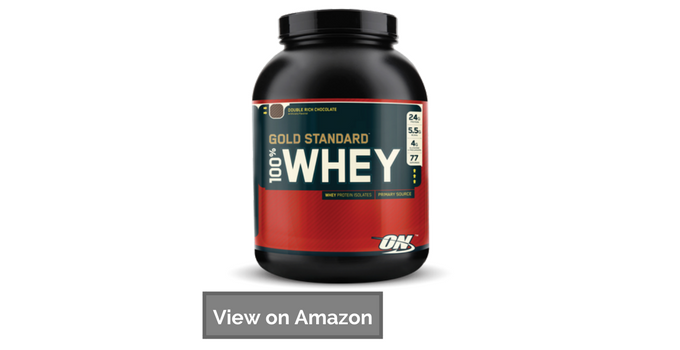 The Optimum Nutrition Gold Standard 100% Whey Powder will provide you with 24 grams of protein in a blink of an eye. It contains only 1g of sugar and fat. This low carb whey protein powder supplement has one more advantage that the first two didn’t have, and that’s BCAA and glutamine. To recover better and to grow muscles, BCAA and glutamine are necessities. This protein contains 5.5g of BCAAs and over 4g of glutamine per serving. It’s a perfect fit to include it in the morning as a breakfast, or before or after your workout. You can consume it before or after your workout or other strenuous activity to grow muscles and to recover quickly. Another great way to use it is first thing in the morning. It can also be used as a keto meal replacement shake. Whatever you choose, you can’t go wrong. If you’re a woman, and you’re dieting than you know how vital calories are. 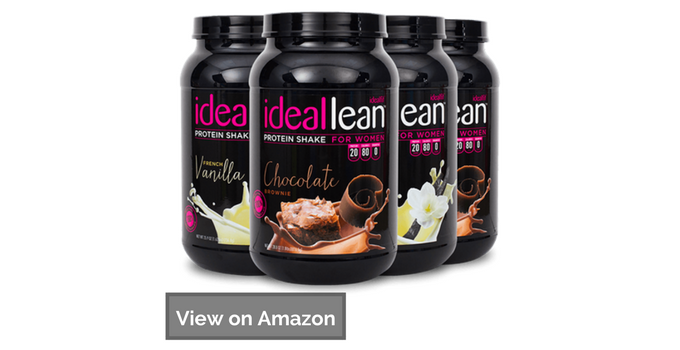 Ideallean Protein contains only 80 calories per serving! It comes with 0 fat, sugar, and carbs. Therefore, this powder, used as a protein supplement, is excellent for weight loss. Combined with a proper low carb diet plan, it will also increase your calorie expenditure. It’s ideal not only for keto diet but every other diet plan. It has a deliciously smooth taste that will leave you satisfied for hours. You can use it during the day as a meal, or as a snack. Hunger won’t be present for an extended period, but the feeling of satisfaction in your taste buds will. However, you’ll get 20g of protein per serving and a fantastic taste. It’s specially made by women, for women. The goal is to help lose stubborn fat, lose weight and to build their ideal body. Proteins will undoubtedly contribute to lean mass muscle growth. It will help you recover faster so you can keep working on your goal. 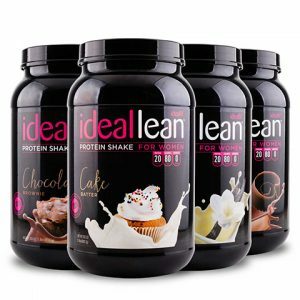 By consuming Ideallean Protein on a daily basis, you will provide your body nutrients that are crucial for your health. It also contains a significant amount of antioxidants. It’s unbelievable that this tasty beverage contains only 80 calories! It’s a relief, when you’re on a diet, to know that you get to enjoy your chocolate taste without the guilt. Protein and fat are essential for our body. Without fats, we wouldn’t survive. That’s why consuming enough protein on a diet is very important. There is a big misconception when it comes to a keto diet. Most people think that they should reduce their protein intake. But, by consuming enough protein, you will automatically consume fewer calories, and you’ll feel more satisfied. You’ll stay full longer; cravings will be at the bare minimum and glucose levels will be low. Your body mass index will be better, also. In addition to that, protein boosts your metabolism. Therefore, you’ll burn more calories! As you know, muscle growth is impossible without protein. Especially in ketosis, you want to make sure that you are losing fat and not lean muscle mass. If you don’t eat enough protein, that goal is harder to achieve. Additionally, recovery will be much faster. Hence, to maintain and to grow muscles, protein should be present on your plate. Even if you’re lightly active, or you do intermittent fasting, protein is a must in your diet. As we age out body may become resitant to a postive effrect of protein. This can be overcomed by taking more leucine. A keto bomb, or also known as a fat bomb, is a delicious snack that filled with fat (high fat), and moderate in protein. They are perfect for those who are on a keto diet and in desperate need of a snack. These bombs can be used as an energy source or as a pre or post workout meal (follow specifically designed keto meal plans ). You’ll get enjoyment without any sugar added! RECIPE 1: These muffin shaped treats will come in handy for any occasion. They look amazing, and they taste even better. STEP 1: Mix in one bowl coconut butter and oil. Add stevia, peppermint extract, and shredded coconut. STEP 2: Into muffin cup spoon about two teaspoons and put in the fridge for one hour. STEP 4: Into muffin cup spoon one teaspoon of the dark chocolate mix. Put it back in the fridge for another hour. RECIPE 2: It’s hard to find a good Keto treat, but this chocolate-fat bomb is two in one. It’s delicious and good for your health all at once. Ingredients: 1 cup of-coconut butter, coconut milk, shredded coconut; vanilla extract, 100% dark chocolate and stevia. Also look up protein pancakes - those are delicious. A most comfortable and most secure way to get into ketosis state is limiting carb intake. That doesn’t mean that you should eat no carbs at all, just small amounts. It doesn’t require you to restrict other types of food or even portions. For a many people, it takes a week to get into ketosis just by consuming carbs below 20/30gr. To maintain this, you have to work hard and with dedication. Also, be very sharp-eyed about the food you eat. You can also check a keto guide for more food choices. Even fruits and vegetables loaded with carbs. We don’t say that they are wrong for you or not healthy; they are just not welcome in keto diet. On the other hand, there are plenty of low-carb vegetables and fruits that are tasty; you just have to know them. For instance, you are allowed to eat leafy greens like spinach, kale, broccoli, etc. Next thing that you can also use to sweeten your meals are berries (raspberries, blackberries). They are delicious and low in sugar. To maintain ketosis state, you need to be very careful about what you put on your plate. Foods that will meet your need on a ketogenic diet are low carb protein shakes and smoothies. You would think that making a mouth-watering keto smoothie is almost impossible. It’s not that difficult, to be honest. A low carb protein shake with enough protein and fat can easily replace one meal. You will burn fat, maintain and support muscle health, and your health will improve. Protein shakes contain about 25gr of protein. Adding some additional ingredients, you will make a keto drink-bomb! But, you will have to be careful when choosing protein powder. Always read labels and make sure that it doesn’t contain more than a few grams of carbs. Some product can even states that it is carb free (no carb protein powder). Protein shakes don’t have that much fat in them. Adding coconut oil or nuts into your shake mix (mixed in shaker or blender) will make them tasty and keto friendly. Also, if you want to add a little bit more sweetness to it, you can add berries. Until you get some ideas on your own, you can try these two recipes. Plant-based low carb protein powders such as hemp, pea and soy I do not recommend (even though it contains additional essential fatty acids such as Omega-3 and 6 you can find in fish oil) unless you’re intolerant to milk and egg protein or a vegetarian. Why? They’re low in leucine, have incomplete amino acid profile and an inferior bio-availability. Like we mentione, maintaining a specific type of diet is not easy, especially if it’s a keto diet. It’s tiring and demanding. But its results are worth it. 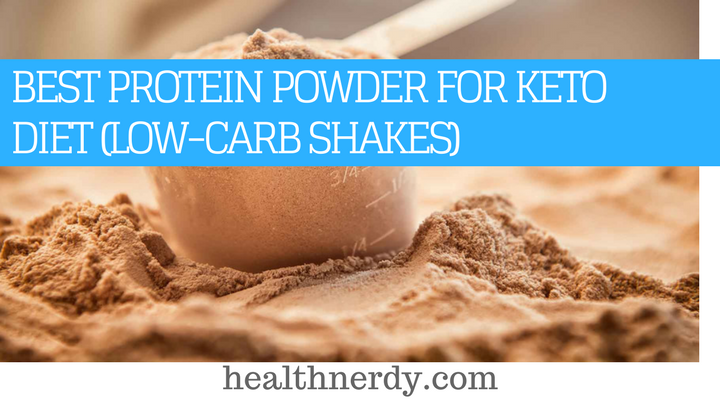 To make it more bearable and enjoyable, protein keto shakes and powders come in handy. These four choices will fulfill all of your needs, for your mind and your body. Low-carb, high-fat diet doesn’t seem so be so scary. You can enjoy your journey to your ideal body and health, and enjoy your meals. Just by experimenting with allowed tasty food, along with the right protein powder, you will have a fantastic result without much struggle.